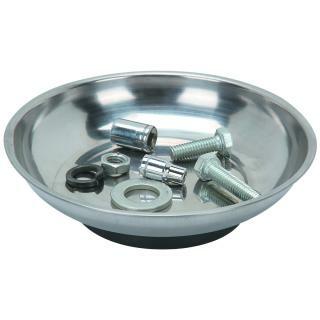 "Magnetic Parts Tray - 6 inch diameter stainless" has been added to your cart. Sandpaper assortment pack 15 pc. This item has saved many game overhaul projects from disaster. You'll never lose that unobtainable fastener or tool again if you park it in this rugged 6 inch diameter. 1-1/8 inch deep stainless steel Magnetic Parts Tray while you work. Has strong rubber cover magnet base that won't scratch surfaces.